There are plenty of people who have undertaken epic self-drive journeys across continents while passing through different countries. However, not many of them can claim to have pulled it off without a support team and backup vehicle. Also, in all probability, there is only one woman of Indian-origin who can claim to have done both. Bharulata Kamble is a mom of two and a typical 43-year old whose daily routine comprises of driving her kids to school and bringing them back home. In between, she also finds time to run her film production company. What makes her different is that she has just completed a solo road trip across 32 countries covering over 35,000 kilometres. Yes, you read that correctly. 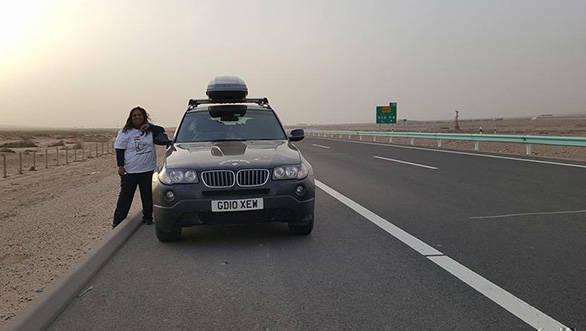 Bharulata treaded across nine mountain ranges, including the super lonely Arctic Circle, three deserts and nine time zones in her family owned 2010 BMW X3. It is the same vehicle that she has been using from the past five years to ferry her family around the United Kingdom. The entire trip was funded by her surgeon husband who is also based in the United Kingdom. She chose to do the trip in her daily driver as she was well accustomed to the vehicle. Before the trip, she got the vehicle checked and serviced for any issues. No mechanical modifications were carried out on the car. During the expedition, Bharulata would check all mechanical bits once a week and top-up the engine oil and coolant if necessary. She had even completed a mechanic course to analyse and diagnose basic problems. 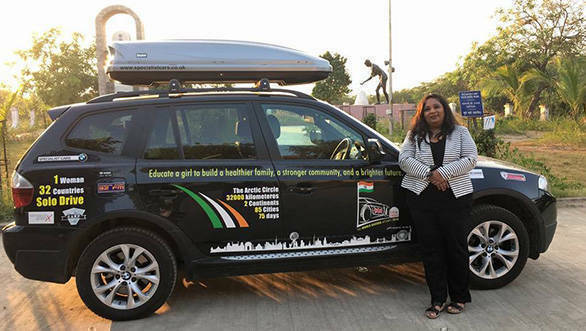 Bharulata began her solo road trip on September 13, 2016 in United Kingdom and intended to reach Maharashtra after driving through the Arctic Circle. She set her first record on September 28, 2016 by becoming the first woman in the world to complete a solo car driving expedition in the Arctic Circle. She drove for 2,792 kilometres in the Arctic Circle and that is the longest distance covered by a woman in that region. Driving in the Arctic Circle that too solo is not easy. "For kilometre after kilometre, there is no one in sight. The mountain passes are narrow, so one has to be cautious. Other than reindeers and black stones on the ground, you don't have anything else for company," she said. So how did she manage to keep calm? A good music collection helped, and whenever she felt too lonely, her husband was just a phone call away. According to the GPS data, she drove an average of 700 kilometres every day in the plains and 400 kilometres in the mountain regions. After reaching India, she drove across 12 states. Bharulata covered 1,110 kilometres in one day while driving from Patna to New Delhi. Upon reaching New Delhi, she was personally welcomed by our Prime Minister Narendra Modi. Her final destination was Mumbai, where she was welcomed by the Chief Minister of Maharashtra, Devendra Fadnavis. Bharulata has always been fond of cars and loves driving. She has undertaken many small expeditions in the past and has driven across multiple countries. She was wanted to drive down from the United Kingdom to India. As expected, not many people were supportive of her dream. "People, even in the UK, commented that I was mental. They said that it would be crazy for a solo woman to undertake this journey. For me, my motivation was that I always wanted to do this." Upon being asked about the general perception that women aren't very good behind the wheel, Bharulata says, "By completing this solo self-driving expedition, I have shown that given an opportunity we women can achieve anything." She is thankful to her husband and kids without whose constant support, fulfilling her dream wouldn't have been possible.